In a seemingly vacant desert lies possible secrets regarding one of the most popular conspiracy theories the world has ever known. Nevada is known for many things including Las Vegas and its deserts. But many wonder what lies within them. Stories of alien spacecraft date back to the late 1940's, but skyrocketed when people discovered Area 51. Some believe this military base is home to alien spacecrafts that are being “reverse engineered” by the government. Others say the allegedly seen “flying saucers” may just be advanced military planes, since some military planes are oddly shaped. Yet there are no known circular military planes. Experts say witnesses who claim to have seen the disc-like flying objects must have seen the shape incorrectly. Ever since the 1950's, the Groom Lake area has been home to the mysterious sight that is Area 51. The base is heavily guarded and surrounded by multiple “restricted” signs. About 95 miles from the heart of Nevada, the facility doesn't appear on any maps. 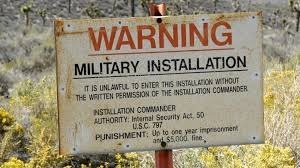 People aren't allowed within 30 miles of Groom Lake; they will be arrested and may even become victims of military force. Still, a few people have snuck in and caught a small glimpse of the base. Also, some satellite photos of the Groom Lake area still exist. Stories of alien spacecraft date back to 1947 when Colonel William Blanchard of Roswell Army Air Field called the press and told them that the Army had found and recovered a flying saucer. He said that he himself had participated in the investigation of alien technologies. Then in 1989, a former employee of the base named Robert Lazar claimed on television that he was directly a part of the investigation of alien technologies. It turned out that Lazar actually did work at the facility. This gave the government further embarrassment and they continued to deny any accusations. In 1993, government officials closed the last reachable public place where onlookers could see Groom Lake. Given all of this information, there is still no tangible proof of alien existence. But it certainly seems like something still worth further investigation.